I always wanted antenna tracker. There are many commercial ones integrated to their OSD’s and transmitting location info back by audio channel or sometimes video. Not the way I wanted and pretty expensive. After switching to my version of OpenLRS I searched for antenna tracker project (source code) suitable for use with OpenLRSng’s transparent telemetry. Then I found Ghettostation by KipK. 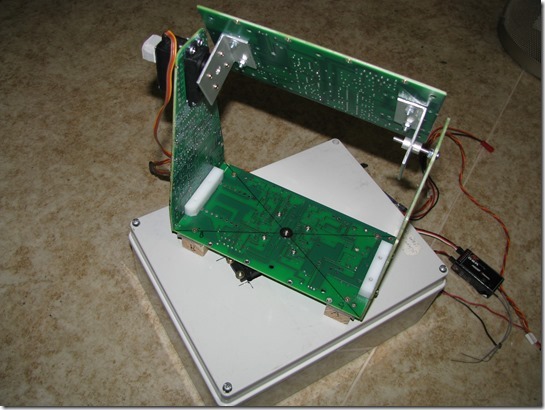 It is running on arduino, has display and buttons and is open source. I havent had Arduino Mega nor Teensy, so I modified source code to run on atmega328. For now I am running it on OpenLRS receiver without RF module. When my Teensy arrive, I will switch it. 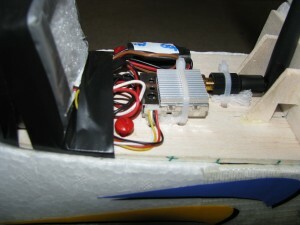 Ghettostation understands several protocols natively, like Mavlink or UAVtalk. This is great, but in some of my planes, there is no autopilot. 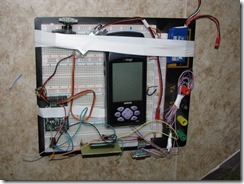 Just GPS and OSD. Also, using Mavlink directly needs to have full featured serial telemetry to plane with XBEE or 3DR modems. To address this, GS has it’s own protocol called LightTelemetry (LTM). It is optimized for very low baudrate and one way communication only. This was meant to be used with FSK audio modems. But it is great for OpenLRSng as well! Kipk included support for LTM in TauLabs and Multiwii, so if you have one of these, load modified firmware and connect it with receiver and you are done. But if you have other flight control or none, I made simple arduino program for parsing NMEA crap and encoding it in LTM packets. I used TinyGPS++ library for parsing NMEA and few lines from TauLabs code. 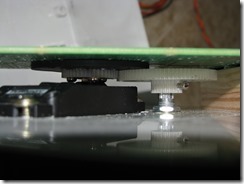 Antenna tracker hardware is still under development, I had to find a good way to do panning. I used what I had around and recycled most of the stuff. 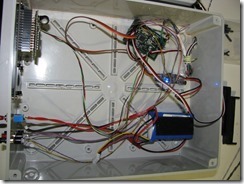 Pan servo is modified to 360 degreed by replacing potentiometer with external one geared from servo output. 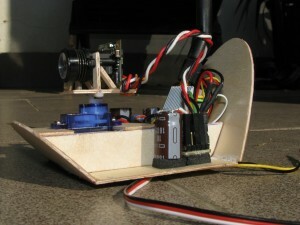 Tilt servo is direct drive. Today I made first field test, walking around with big breadboard and great wire mess. Whole setup worked, tracker was pointing at me all the time! There is still issue with pan servo precision and ancient Garmin GPS is not very accurate, but still big success for me. 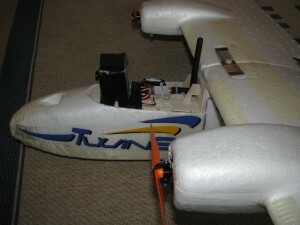 Can’t wait to finish this and fly with tracker on regular basis. As a future feature, my plan is to add piece of code into GS to reconstruct NMEA sentences from LTM to use Oziexplorer (or any other desktop map software – no google maps) on PC to see my plane on map. 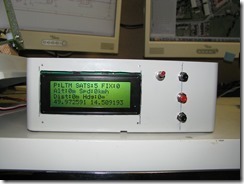 * using only one serial port: GPS output to RX pin, TX pin to datalink input. * Ghettostation one way telemetry protocol for really low bitrates (1200/2400 bauds). 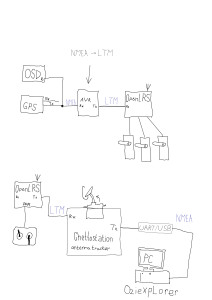 * Protocol details: 3 different frames, little endian. This entry was posted in Uncategorized on March 15, 2014 by mirek. I started with famous Twinstar II by Multiplex. 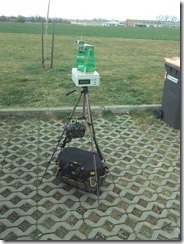 Then first steps with Lawmate 2.4GHz/500mW, B/W CCD camera and laptop with USB digitzer. My first ever FPV flight ended really quick, my camera can not stand freezing temperatures and stopped working after few seconds. FPV was put off for a while. I crashed original TS2 too many times during LOS flying, I decided to buy Eaystar. 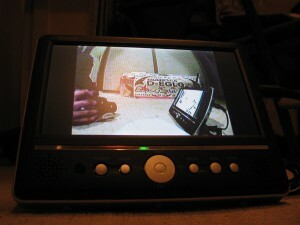 I got new 480TVL camera, new 7″ portable TV, reused old Lawmate, RC on 35MHz. 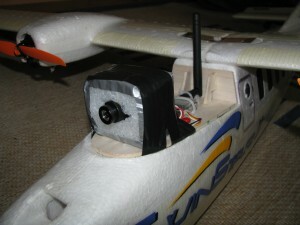 With this setup I finally made some real FPV flights. Max range was about 800m, then RC start to drop. 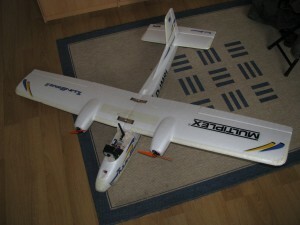 This plane died in nose dive after failure of my transmitter (Hitec optic 6 sport). 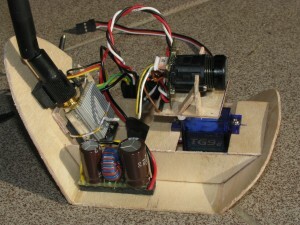 Luckily FPV pod was not there and only flying LOS. This entry was posted in Uncategorized on October 3, 2013 by mirek.